A formation of F-35A Lightning IIs, from the 388th and 419th Fighter Wings, fly over the Utah Test and Training Range. As the first combat-ready F-35 units in the Air Force, the 388th and 419th FW at Hill Air Force Base, Utah, are ready to deploy anywhere in the world at a moment’s notice. 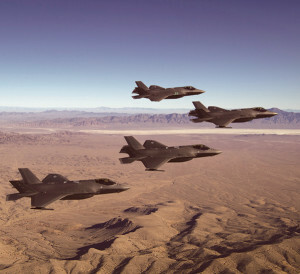 Pilots and maintainers from the 388th Fighter Wing based at Hill Air Force Base, Utah, are bringing the F-35A and ‘increased lethality’ as they take a lead role in Red Flag 19-1 at Nellis AFB, Nev.
From Jan. 26-Feb. 15, approximately 200 Airmen from Hill AFB, including reservists from the 419th Fighter Wing, will participate in what is known as the Air Force’s premier combat training exercise. The 388th FW debuted the F-35A Lightning II at Red Flag in 2017 and came away with a 20:1 kill ratio. The jet is even more capable now, pilots say. The three-week exercise sees friendly “Blue Force” take on enemy “Red Force” aggressors in intense training environments to test air-to-air, air-to-ground, and space and cyber warfare. This year, once again, the F-35A is set to provide offensive and defensive counter air, suppression of enemy air defense, and close air support against enemy forces. Pilots and maintainers from Hill AFB will work with other Air Force units flying a variety of aircraft alongside allies from Great Britain and Australia. Typically, about 2,000 personnel and more than 100 aircraft participate in Red Flag exercises, which take place throughout the year at Nellis AFB. While at Red Flag 19-1, F-35 maintainers will generate multiple sorties and will be challenged to maintain a high ops-tempo during both day and night missions. The first operational F-35As arrived at Hill in October 2015 and reached initial operational capability in August 2016. The active duty 388th FW and Air Force Reserve 419th FW fly and maintain the jet in a Total Force partnership, which capitalizes on the strength of both components. By the end of this year, Hill AFB will be home to 78 F-35s.